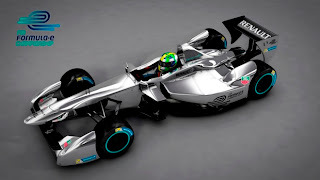 Electric Race News: Is the Formula E being extravagent with two electric race cars per driver? Is the Formula E being extravagent with two electric race cars per driver? Is Formula E's plan to have two cars per driver a super-extravagence? This is a question raised in comments on a posting on another site (see link below) reporting on the Formula E 2014 season calendar. Because the Formula E cars have battery packs that support only 15-20 minutes of racing, and the Formula E race is supposed to last much longer (90 minutes? ), each driver will race until the pack poops out, then switch cars. Presumably the pooped-out car will be fast charged in the pit lane so the driver can switch back, because the way I calculate it they'll need 4 phases of racing to hold a full 90 minute long race. I covered this in more detail in an earlier post. It does mean the Formula E organizers are building 42 race cars to have two cars for each of the 20 drivers that will be in the series. Theoretically it would be possible for Forumla E to have built only 22 cars. But that would leave the problem of how to quickly recharge the battery pack, because it wouldn't be much of a race not to say much of a testament to EV's for each car to pause for 20 minutes every 20 minutes for a quick charge. One of the commentators suggest - fast swapping battery packs. Other commentators following that one talked about whether that would be safe or whether there would be arcing at the connectors, with fatal consequences, while even others point to the capabilities of the Better Place fast pack swapping mechanism. Consider that a fast battery pack swap would be exactly the same as when a gas powered race car pulls into the pit to refuel the gas tank. What those commentators do not know about is fast battery swapping that was used by an earlier electric race car series, that predated the Better Place battery swapping system by nearly a decade. This occurred in the 90's in an electric race car series called, if memory serves me right, Formula Lightning. My reference material is thousands of miles away, and I cannot double check the name of the series. What I do know is that electric racing pioneers like Ely Schless and Bob Schneveiss developed electric race cars with fast swap battery packs. Ely claims he did it first, then everyone else followed his design, but I wasn't there in person and don't know this for sure. In any case, what I was told is that the car would pull into the pit, a pit crew with some kind of floor jack cargo mover dohickey would go to each side of the race car, undo the (simple but high powered) connectors on the battery pack, scoot the pack out of the way, roll a new pack in place, redo the power connections, and it would take something like a minute or two, and away the car goes. In the meantime the pit crew connects the depleted pack to a fast charger. The battery pack on these cars was two long boxes containing Trojan flooded lead acid batteries, located on both sides of the car, between the wheels. Yes, lead acid. Flooded lead acid. This was the 90's. My how far we've come in just a few years. It worked fine with simple but effective power connectors. No fatal arcing etc, and doesn't even rely on something fancy schmancy like the Better Place robotic system. By the way there is a different electric car racing series that may be starting in 2014, who (the last time I talked with them) was planning to use the Better Place fast swap system. But since then Better Place has run into seriously bad problems, and I also haven't heard from the founder of that race series for awhile. A few minutes ago I read a news article saying that Amprius has developed a much higher density battery pack system. Higher energy density will mean a race car with a 40 minute or more run time rather than 20 minute run time. Maybe. A lot will depend on whether the technology from Amprius would support the power levels required for a race car, and whether it is safe for fast charging. If it can do both, this would radically change the characteristics of all forms of electric racing. For example the electric motorcycle racing has been limited to 22-25 mile long races, while AMA superbike races run for 55-60 miles. The Amprius batteries offer enough more energy to support a full length electric motorcycle race. Maybe the Formula E plan for two cars per driver is excessively extravagant. However, it's my understanding that Pro racing teams show up with extra vehicles anyway - for example to resurrect crashed vehicles from spare parts on backup cars. At the same time it's clear that enough high end battery advances are being developed that shortly enough we'll have a range of higher energy density choices for electric race vehicles. In a few years we may be seeing full length electric races, with no need for things like swapping cars or swapping battery packs.